Ryan Miller needs to help the Sabres make their playoff push. Goalkeeper Ryan Miller and the Buffalo Sabres are trying to shake off what has been a disappointing season so far and make a push to the playoffs. They are currently on a bit of a streak, and their offense has started to heat up after a dire year but the biggest X Factor as it were for the Sabres playoff push might be the man between the pipes and the winningest goalkeeper in the history of the franchise, Miller. TSN’s Rory Bolan put out an article on Tuesday with the thought that Buffalo was indeed going to get the eighth seed in the Eastern Conference thanks to some possible Ryan Miller heroics. After all, a hot goalie can carry a team not only through the playoffs, but to the playoffs. Not many goalies are hotter than Ryan Miller right now. They won’t be expected to make all that much noise in the playoffs if they can get in, but for a team whose ‘Sole purpose for existence from this point forward is to win Stanley Cups‘, missing the playoffs has got to be a completely unacceptable premise. Miller is currently 23-18-5 on the season and his last ten games have been, though not absolutely spectacular, peppered with wins. The Sabres have only lost once in regulation in that span, going 7-1-2, and Miller has two of his five shutouts of the season in the span as well. After beating the Carolina Hurricanes 3-2 on Wednesday, the Sabres are only two points out of the eighth place Winnipeg Jets, tied with the Washington Capitals with 70 points. The schedule isn’t particularly kind to the Sabres, but the win over the Canes was a big help. 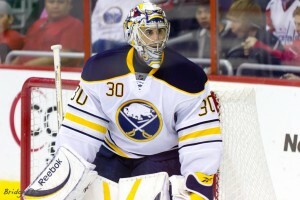 As Ryan Miller goes, the Buffalo Sabres go. With big games against teams like the Bruins, Penguins and Rangers coming up in the last few games of the season, Miller is going to need to be bigger than ever.